Educational institutions� Purchase Orders are welcome. Place your order in our wholesale store on-line or call our customer service tel: 800-970-1128 or send your purchase order order by fax: 360-835-7188. We are accepting payment via Purchase Orders, Credit Cards Visa, MasterCard, AMEX, Discovery, PayPal and wire transfer from bank to bank. 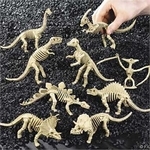 Dinosaur Skeleton Figures 2", 48 pcs. Bendable Dinosaur T-rex Skeletons Figures 5.5 inch, 24 pcs.